Jeralean Talley has probably seen a lot in her lifetime, and the stories she could tell would have a person listening for days. 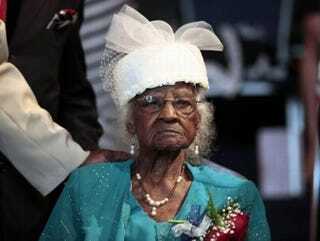 At 115 years old, Talley, of Inkster, Mich., is now the world’s oldest living person, after the death of 116-year-old Gertrude Weaver. Talley was born May 23, 1899, in Montrose, Ga., but has been living in the Michigan area since 1935. What’s Talley’s secret to a long life? During her interview with CBS Detroit, Talley had a few words of advice for everyone. “Treat the other fellow like you want to be treated. You don’t tell a lie on me, so I won’t tell a lie on you,” she stated.